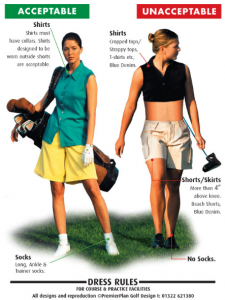 Women’s Golf – is the One Size Fits All Dress Code Dead? Any designer of women’s golf wear has one ear tuned to style and fashion and the other to the dress codes that govern what Golf Clubs will allow you to wear. Before designing Pohli’s range we did some research – the most commonly ‘approved’ skirt length was ‘mid-thigh’. The next in line was “4 inches above the knee”. Which bit of the knee you measure from is never explained, but with horror stories of women forced to kneel to have the measuring tape applied we assume that’s what goes down in the ultra-conservative clubs. Going with the flow, Pohli finishes our golf skirts at the mid-thigh length but with a generous double pre-stitched hem that allows the skirt to be lengthened 3-3.5cm without any sewing. 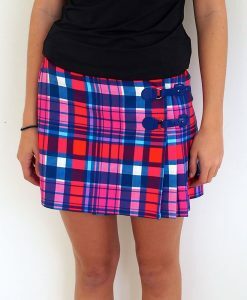 But the ‘right’ length for golf skirts remains a debateable subject. Here’s what we identify as the key variables. We found an interesting Daily Mail piece charting the ‘acceptable’ skirt lengths for women as they age. According to this 40 has traditionally been regarded as the time a women should move from mid-thigh to something longer. One up for the ‘conservatives’? However… the same article highlights not only that younger women wear much shorter skirts, (how many golf clubs recognise this no-brainer?) but that older women in great shape are bucking the trend. Fifty is the new Forty and and if an older woman looks good in a shorter skirt why shouldn’t she? One up for the rebellion. Women’s golf is a sport. It’s generally accepted you can ‘get away’ with a bit more with sportswear. Sportswear is generally a bit shorter, stretchier and spunkier than your average fashion wear. 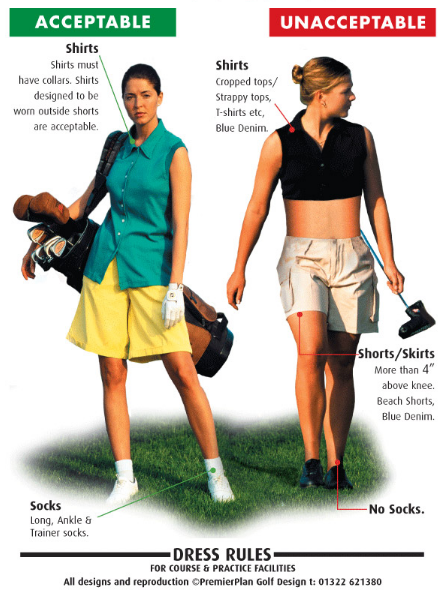 We think that means that as a general rule, you should be able to wear your golf skirts a little bit shorter for golf than you would in everyday life. Another one for the rebellion. Hmmm… but golf is different – isn’t it? Well yes it is. It constantly amazes and delights me to see the maturity and grace displayed by young golfers under exactly the same pressures that their peers in other sports (mentioning no names but …tennis) use as an excuse to behave appallingly. Women golfers like to look good. And looking good in golf wear depends on so many factors. Some of us get it wrong, but most girls who have devoted the time and energy it takes to be a golfer and who have spent a bit of time around golf clubs have a pretty good idea as to the balance between what looks good and what is appropriate to the traditions of golf. That will be different for a twenty year old than for a forty or fifty year old. But here’s what happens when the Dress Code fanatics let loose. The image below is currently doing the rounds. No prizes that the chick on the right is inappropriate (when was the last time you saw a mid riff top at a decent Golf Club? ), but the ‘role model’ on the left? That shapeless over-long shirt? The untailored hem left flapping in the wind? The baggy knee length shorts? Not to mention the out-dated (in fact when was it ever in fashion) Green and Gold colour combo? The future of Women’s Golf Wear – Really? Did both these women get dressed in the dark? We think the ‘one size fits all’ dress code for women golfers is dead. But any alternative that tries to deal with the variables that really impact on how smart someone looks in any given golf wear – is, for obvious reasons – doomed to failure. Our suggestion is that the code be replaced with a statement of intent: a statement that explains the standards and traditions that a particular club strives for and seeks for its members and guests to uphold and how that should be reflected in how we turn out to play. Sure it’s not going to rule out the odd disaster (and no code ever will either) but if it’s explained nicely, rather than dictated in School marm fashion, we’re sure women golfers will step up to the mark. For the wording? Well we acknowledge that’s tricky (and the Golf Show’s about to start….) but we’ll be back to this with a later blog.